Brown hamburger with onions, add refried beans and heat thoroughly (I add the beans to make the filling stretch a little farther, but you don’t have to use them). 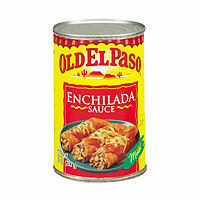 While hamburger is cooking, combine the enchilada sauce and the cream of mushroom soup in a mixing bowl. Use a little of the sauce mix to coat the bottom of a cake pan and begin filling your tortillas. After filling the tortillas, use the rest of the sauce to cover the tops of the enchiladas and sprinkle with grated cheese (I like to use cheddar, but Mexican blends are also good). Bake in the oven 345 degrees for 30-45 minutes. For more beef recipes, click here.